Use this Lavender Soap Recipe to create a bar that is always a welcome addition to any bathroom. Lavender essential oil's calming scent is a great way to finish the day, especially when enjoyed in a warm, bubbly, soothing tub. This soap recipe is a two step process (if you use the design idea pictured) so be sure to read it through first. For a more 'well-rounded' lavender scent, try using a blend of lavender essential oils rather than just one variety. Lye - 125.6 gr. | 4.42 oz. Follow the instructions on the "How to make soap" page, make a batch of Basic Homemade Soap and when it is finished insulating, follow the directions for creating soap ribbons. 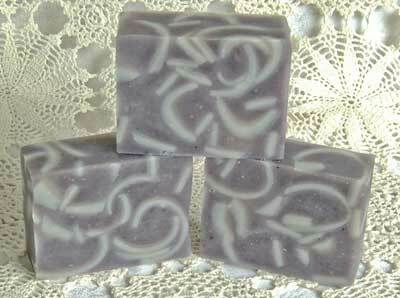 Follow the instructions on the "How to make soap" page to make the base soap. Mix the mica and ultramarine with a small amount of oil and blend until all lumps are gone. Put aside. Once the soap batter reaches a thin trace, add in the confectioners sugar, orris root and mica ultramarine mixture. Continue to mix until a medium trace has been reached. Add in the lavender essential oil. Do not be alarmed if your soap trace seems to thin. For some reason lavender essential oil sometimes will slow down and even reverse trace a bit. Keep mixing until a medium trace is again reached. Drop your soap ribbons into the soap batter and gently mix. Carefully pour the soap into your soap mould and insulate as usual.